67 Acres (+)(-) An exceptional property with many investment and development possibilities! This unique property is located just a short distance north of the Cooper Lake in the Klondike area, approximately 2,367 ft. of frontage on State Highway 24, and frontage on County Roads 2033 and 2031. 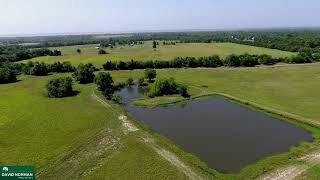 The property has a small shop that was used for an office and storage, two ponds, one being rather large and scenic. Agricultural exemption in place and currently being cut for hay. See supplements for location map, aerials, and topographical map. Public Driving Directions:	From Commerce, State Highway 24 north to Cooper. The property will be on your your and starts at the intersection of State Highway 24 and FM Highway 1528.